We are in the process of a much needed office clean up, and in the process today found a copy of our first text book on cel nav dated 1978—a loose-leaf set of pages that we photocopied (or maybe even mimeographed! for classes). In that book we found a page related to the Fit-slope Method that we use to analyze sights in our book Hawaii by Sextant. It is not clear how relevant this is in light of other options, but it does show how we were discussing this a long time ago, and this discovery led to the thought of archiving some of these obscure materials that have moved in and out of our mainstream teaching. Below is the related page... as it turns out there are rather a lot of these items. Zoom for our 1978 description. To use it you go down the left side to your latitude, then across to the azimuth angle (figured from actual Zn) and then go up to the top to get the slope in arc minutes of Hs per 1 minute of time. For example at lat 42 a body with Z = 64 and 81, rises respectively at 10' and 11' per minute. Note that this result does not matter what body it is, North or South Lat, and it could be to the left or right of North or South by Z. If your actual sights had a Z of say 73, then the slope would be about 10.5' These are the conditions of Problem 3 from Hawaii by Sextant. If you have taken multiple sights of a body in these conditions, and you plot Hs vserus WT (sextant height vs watch time), then these sights should each fall on a line that has a slope of 10.9' per minute. You draw that slope on the graph and then move it up and down with parallel rulers to find the best fit to the data, often spotting outliers. So that is a shortcut way to get the right slope, which could save time in some circumstances, but we can also get this result manually direct from modern sight reduction tables by just doing the sight reduction of the first sight of the session to get Hc, then do one for the last sight of the session to get Hc, and the difference in Hc divided by the difference in times is the slope we want. An example from Problem 3 in Hawaii by Sextant, which is a series of 5 sun sights starting at 0827 and ending at 835. From Pub 229 we find the Hc at each end and subtract go get a slope of 11.0' per min. Recall that LHA increases at 15º per hour so every 4m of time is 1º of LHA. 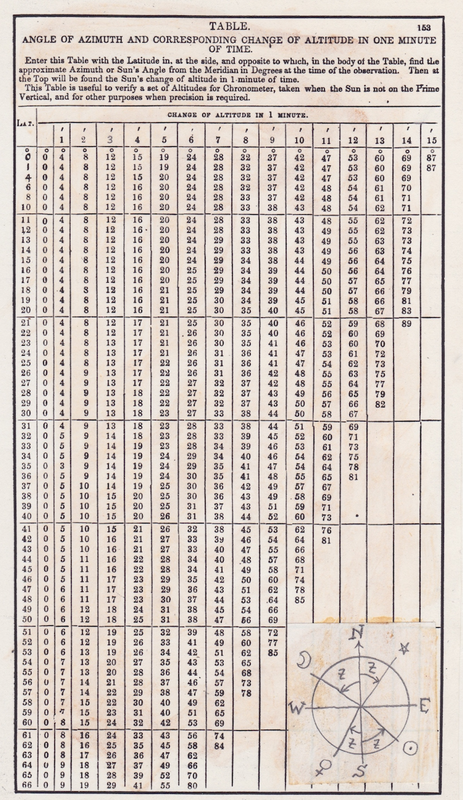 Back in the day when folks actually used cel nav for routine navigation, the Pub 214 Sight Reduction Tables actually listed the slope of Hc every hour of LHA, which then was presented as hour angle HA (0 to 90). It is not clear that they anticipated this application; it was there primarily to allow plotting an LOP from a DR Lon on the assumed Lat line. Our start HA was 80, ie a body that has LHA 280 is 280 west of us, which puts it 80 east of us. At the end of the sights this moved to 78 east of us. The delta d is same as we now call d-value; the delta t is what we are after, which is change in Hc for each 1' of HA. Multiply that by 15 and you have the change in Hc for 1m of time. BUT... we have to know that these values of delta d and t are given multiplied by 100. That is the 73 we see should really be 0.73. I would like to say it is strange they do not explain that in the book, but it is actually not so strange for early nav books to gloss over details that are crucial to their application—the mumbo-jumbo factor. Thus we see that 0.73 x 15 = 10.95' is the slope we want, from just one multiplication.